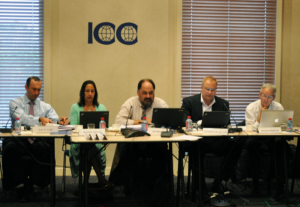 Business and legal professionals representing over 20 organizations came together in Paris this week at a meeting of the ICC Commission on the Digital Economy. The meeting was led by incoming Chair Joseph Alhadeff who began by paying tribute to his predecessor Herbert Heitmann, former Executive Vice-President of External Communications at Royal Dutch Shell, for his long and valuable service to the commission during his six-year long tenure as commission chair. The biannual gathering presented a chance for members to assess the current digital economy landscape and discuss strategic priorities in light of developments relating to Internet governance, data protection and privacy. Mr Alhadeff underscored that privacy, along with the broader issue of Internet governance and cyber-security, were priority issues for the commission along with the development of a new Global Action Plan for the Digital Economy. A ready and practical compendium of business positions, the first edition of the action plan was originally submitted on behalf of business to a ministerial conference on electronic commerce, jointly organized by the Organisation for Economic Co-operation and Development and the Government of Canada in Ottawa in 1998, where it was well received as the consensus business input. Day two of the meeting commenced with an update by Christiaan van der Valk and Jacques Beglinger, co-chairs of the ICC Task Force on Security and Authentication, on preparations for an ICC conference on paperless trade facilitation. Scheduled to take place in 2014, the conference aims to practically address concrete problems faced when trading digitally. Vice-chair of the commission Gerard Hartsink led a discussion on the possibility of developing an impactful and practical set of ICC guidelines to help executives understand and enhance company cyber-security. “As e-business grows so does cybercrime. A lot of companies, particularly small- and medium-sized enterprises are asking for help and ICC is very well placed to help them,” he said. Eric Loeb, Vice-President, of External Affairs at AT&T and Chair of the ICC Task Force on Internet and Telecommunications, wrapped up the meeting agenda by updating members of the commission on the work of the task force, as well as outcomes of meetings of the World Telecommunication Policy Forum and World Summit on the Information Society Action Lines Forum which took place in May. Mr Loeb also looked ahead to meetings including an Internet Corporation for Assigned Names and Numbers meeting in South Africa in July, October’s Internet Governance Forum in Indonesia, and the International Telecommunication Union Plenipotentiary Conference in Busan, Republic of Korea from 20 October – 7 November.